GRADES OF GREEN STUDENTS HELP MANHATTAN BEACH PASS STYROFOAM BAN! Manhattan Beach recently passed what is being hailed as "the strongest Styrofoam ban in the country," thanks to an assist from eight Manhattan Beach Grades of Green students. 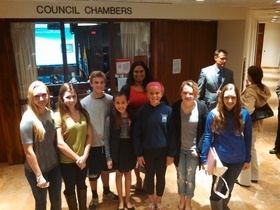 During the January 7th City Council Meeting, students ranging from elementary school to high school spoke up at the meeting in favor of the Styrofoam ban. They shared their knowledge about how Styrofoam harms our environment, testifying that "foam makes up 71% of the plastics that flow through the Los Angeles and San Gabriel river and then directly out to the Pacific Ocean; that foam is the second most common type of trash on California beaches; and that 36% of the fish sampled in the Pacific Ocean in 2009 had ingested small bits of plastic litter, like foam." The students concluded by thanking City Council and stating, "Let's keep up the good work by getting rid of foam! We love our city and want to keep the beautiful environment around us healthy and clean, we all deserve it." Way to go students on being part of such an amazing environmental victory for your city! Check out this video to see the kids in action. And don't forget to check out Grades of Green's Students in Government Activity to see how you can activate student voices for environmental change in your community!